Thousands of pets die of poisoning each year. One of the most common sources of these poison is your garden. Autumn Crocus, Azalea, Cyclamen, Daffodils, Dieffenbachia, Lily of the Valley, Sago Palm, Tulips (& Hyacinths), Lilies and Oleander. Even some fruit trees and plants can be poisonous to dogs. These include apples, apricots, cherries, grapes and peaches, among others. The symptoms of plant poisoning can vary depending on the plant that your dog ingests, and even upon the breed of your dog. Watch out for excessive salivation and changes in skin color around the eyes, mouth and paws. Symptoms of poisoning can also include: vomiting, diarrhea, renal failure, depression, lethargy and even death. Damage to the liver, kidney and central nervous system are also possible, though somewhat rare. Early treatment of plant poisoning is vital in order to save your dog. If you believe that your husky has ingested part of a poisonous plant, remove the plant from their mouth right away. Gently rinse their mouth with water and call your veterinarian immediately. It is critical to know the scientific name of the plant that your husky has ingested. 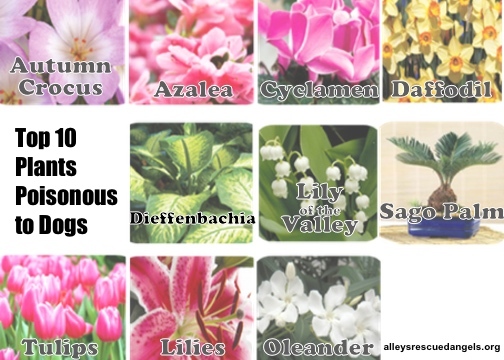 The reason for this is that common names for plants can vary from region to region. Not knowing the correct name of the plant your dog ingested can result in improper treatment, putting your dog’s life in further jeopardy. If you can, bring a part of the plant that your dog ingested with you to the vet. If you and the vet can’t determine the scientific name of the plant your dog ingested, consult with a local florist, nursery or botany department at the local college. Photos on relevant Internet sites can be helpful too. Knowing what types of plants can be dangerous to your dog is the first step in preventing your husky from being poisoned. There are still dangers, however. Remember, even if your yard is free of poisonous plants, that doesn’t mean that your neighbors’ yard, or the places you take Fido for a walk, are free of poisonous plants or pesticides too. Many of the flowers found in birthday bouquets, and other flower arrangements, are also poisonous. Easter lilies are especially poisonous, so be careful should you get some for the upcoming holiday. We hope you never need it, but we think it is a good idea to keep this information handy.